Let's Stop HIV Together and Facing AIDS at AIDS 2012This Labor Day, like many Americans, I spent time with friends and family and took photos that I shared with my mobile phone. Today, sharing photos on platforms such as Facebook and Instagram (we'll write more about Instagram in a future post) offers an easy opportunity to share information about yourself and causes you care about with your social network. In the HIV community, photo sharing campaigns provide a means to mobilize around the HIV epidemic. In July, AIDS 2012 conference participants had an opportunity to participate in several photo sharing campaigns, such as the Turning the Tide, Let’s Stop HIV Together, and Facing AIDS and the AIDS 2012 Facebook page. Scott Sanders, Consultant to International AIDS Society, shared his experience with this initiative. He noted how some organizations used it as an opportunity to organize and energize members before the conference. From the perspective of the conference organizers, the photos helped populate the AIDS 2012 Facebook page in the days leading up to the conference. Changing the main Facebook photo daily with a new “Turning the Tide Together” image led to an immediate increase in the number and activity of AIDS 2012 Facebook followers, with a significant increase in “likes.” AIDS 2012 also tweeted a new picture daily and experienced some of its highest retweets of the conference. The Centers for Disease Control and Prevention, where you can also view the photo gallery and access campaign public service announcements. Additionally, you can go to Act Against AIDS to access campaign materials. And you can promote the campaign with the hashtag #StopHIVTogether. Adding your photo to the Facing AIDS app is now available for free on the iTunes App Store. The app makes it easier than ever to help end the epidemic through your personalized photo and message through three quick and easy steps. The app can be used by individuals or at group events. These photo sharing campaigns provide great opportunities for community engagement. Please tell us how you evaluate the impact of photo sharing. 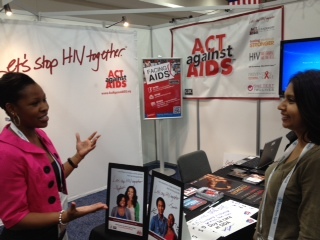 Join HIV.gov for photo sharing opportunities at the U.S. Conference on AIDS and World AIDS Day 2012! Special thanks to Solange Han-Barthelemy, Health Communication Specialist, Division of HIV/AIDS Prevention, NCHHSTP, CDC for contributing to this post.